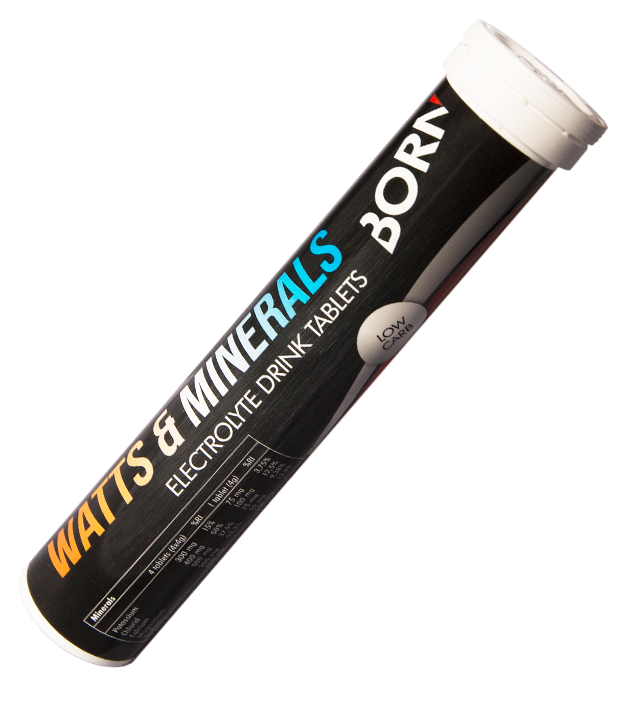 Watts & Minerals is an effervescent tablet that dissolves in water or can be added to your sports drink as an 'upgrade' on hot training days. The effervescent tablets contain the electrolytes magnesium, sodium, potassium, chloride and calcium. This supports the energy level (when adding it to a sports drink), the energy metabolism and contributes to a proper electrolyte balance (magnesium). In addition, supports the functioning of the muscles. If you only use Watts & Minerals in water, the drink contains no calories and can therefore also be used in low-carb workouts. In addition to the mentioned minerals, Watts'Up® is added, which gives that little bit extra that can make the difference. acidity regulator (citric acid), firming agent (sorbitols), sodium bicarbonate, citrus sinensis whole fruit extract (WATTS’UP®), magnesium carbonate, calcium carbonate, potassium chloride, flavourings, sodium chloride, beetroot concentrate powder, firming agent (polyethylene glycol), sweetener (sucralose); colorant (riboflavins). Food supplements should not be used as a substitute for a varied diet. Store dry and keep outside reach of young children. WATTS’UP® is an all natural citrus fruit extract designed to improve power and energy in trained athletes and sporty people.